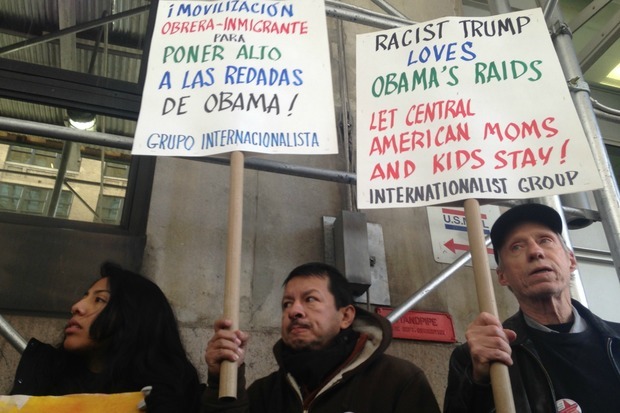 People protested recent deportations outside the federal immigration center on Varick Street. HUDSON SQUARE — A crowd gathered outside the immigration courthouse Friday to protest the recent raids that have rounded up more than 100 undocumented immigrants across the country for deportation. The rally outside 201 Varick St. was organized by the advocacy group ICE-FREE NYC, whose name is a reference to Immigration and Customs Enforcement, the federal agency responsible for deporting immigrants who are in the country illegally. "I think that the protection of the right to come to this country to escape, whether it's war in Syria or war and oppression in Latin America and Central America, are what this country is founded on and what this country should stand for now," said Ed Goldman, 69, who was holding a sign that read, "No human being is illegal." "My father's from Cuba and my mother's from Ireland, and had it not been for accessible pathways to citizenship, I would not be here," said Carlene Pinto, 27, who held a sign portraying artwork by children in detention centers. Pinto, who lives in Red Hook and is an immigration advocate, said even though there were no confirmed reports of raids in the New York, "all of this activism and work is to make sure people have the information and resources when and if it does start." But not everyone who showed up at the protest agreed. Jim MacDonald, 66, held up a sign that said "Deport illegal aliens" in big block letters so passing cars could see it. MacDonald is with an organization called New Yorkers for Immigration Control and Enforcement, which he said has about 15 active members and about 30 "who sometimes show up." "We are opposed to illegal immigration," said MacDonald, of Flushing. "The executive order that Obama just announced [authorizing the deportations] is only for illegal immigrants who have been here less than a year." One day prior, City Council Speaker Melissa Mark-Viverito spoke against the deportations at a press event in Corona accusing the federal government of "ripping families apart, separating families, and putting them back in very difficult, very horrific violent situations." Mark-Viverito assured undocumented New Yorkers that they would be safe in this city. "You overcame insurmountable odds to be here and you belong in New York City," she said. "New York City cannot and will not turn its back on our immigrant community." She urged undocumented immigrants to seek help from the Immigrant Defense Project by calling 212-725-6422. After the rally outside immigration court, some activists took to the street, blocking traffic on Varick Street. Activists said on social media that people were arrested. 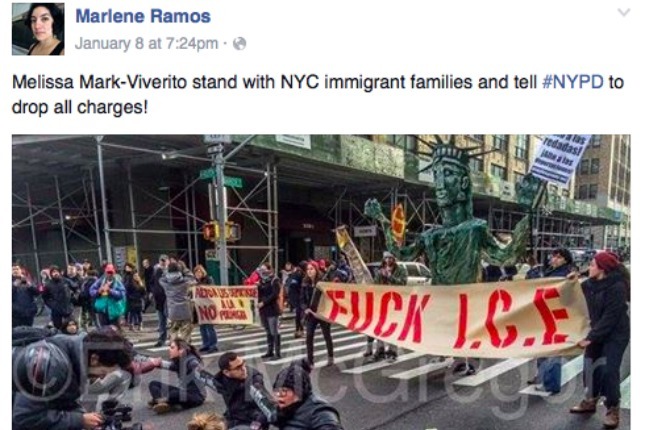 On the Facebook event page for the rally, they asked Mark-Viverito to help those who had been arrested. The NYPD could not immediately provide information on on how many people were arrested, and did not have the information on hand on Monday. An emailed inquiry was not immediately returned.